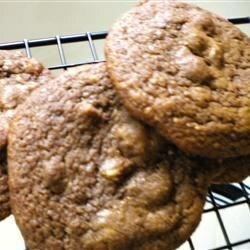 "Big, soft cookies with macadamia nuts, chocolate and powdered espresso." In a medium bowl, cream together the butter and brown sugar. Add the eggs, one at a time, beating well after each addition. Beat in espresso and vanilla. Mix until well blended. Combine the whole wheat flour, baking soda and salt; stir into the creamed mixture until well blended. Melt chocolate in double boiler over low heat. Let cool to room temperature. Stir into mixture. Mix in nuts until well blended. Drop 3 inches apart on cookie sheets and bake for 12 minutes, or until crisp around edges. The most amazing cooies ever! I put in in coffee flavored bits of chocolate. Absolutely decadent!